Hong Kong is my favorite city in the world, and over the years I’ve visited it dozens of times. There’s something about the vibe of the city that energizes me, unlike anywhere else I’ve traveled to. Ironically enough I’ve actually not really checked out the Hyatt and Starwood options thoroughly, despite those being my two primary hotel loyalty programs. This time around I decided to stay at the Grand Hyatt Hong Kong, which is objectively the best Hyatt property in Hong Kong. While Grand Hyatts are of varying quality, this is considered to be one of the flagship international Grand Hyatt properties, and the prices reflect that — rates are consistently ~$400+ per night. The Grand Hyatt Hong Kong is a Category 6 Gold Passport property, making a free night redemption 25,000 points per night. I didn’t want to spend $400+ for the night and also didn’t want to redeem 25,000 points, but fortunately the hotel had Points + Cash availability. That made the cost of my one night stay 12,500 Gold Passport points plus $150. Category 6 Points + Cash redemptions are among my favorite values, especially in relation to the cost of an outright points stay. Keep in mind that Points + Cash bookings qualify for stay credits and Diamond Suite Upgrade Awards. 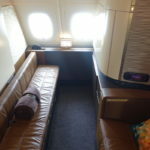 While I didn’t redeem a suite upgrade in this case, I did like getting a stay credit and having it qualify towards Hyatt’s first quarter promotion. Anyway, I apologize in advance that this review won’t be that detailed, since I literally got to the hotel at night, ended up going out pretty late, slept for four hours, had a busy morning, and then rushed to the airport. So I didn’t have a chance to check out the pool, gym, etc. The Grand Hyatt is located on Hong Kong Island (as opposed to the Hyatt Regency in Kowloon, which is across Victoria Harbor), right along the waterfront. 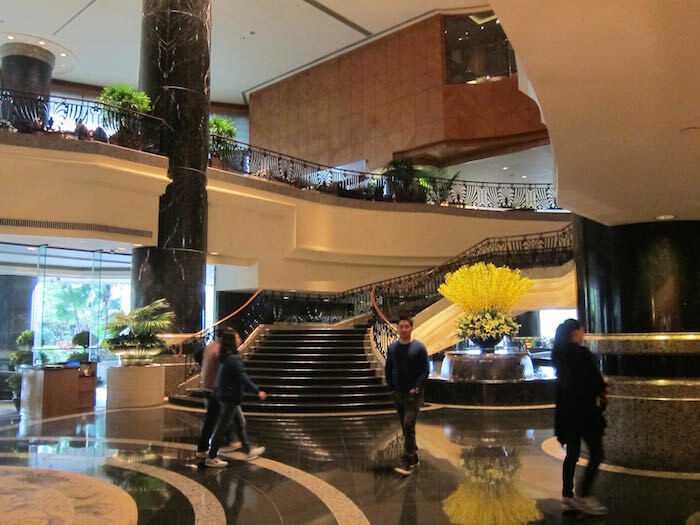 As I entered the lobby I immediately could see why this would be considered one of Grand Hyatt’s flagship international properties, given that the lobby was… grand! It was one of the most gorgeous and elegant Hyatt lobbies I’ve seen. The check-in process was efficient, and within minutes I was given keys to my Grand Harbour King Room. I was also given a sheet explaining the features of the Grand Club, which I had access to thanks to my Diamond status. I took the elevator up to the 25th floor, where my room was located. I was assigned room 2513, which was located down the hallway and on the right. 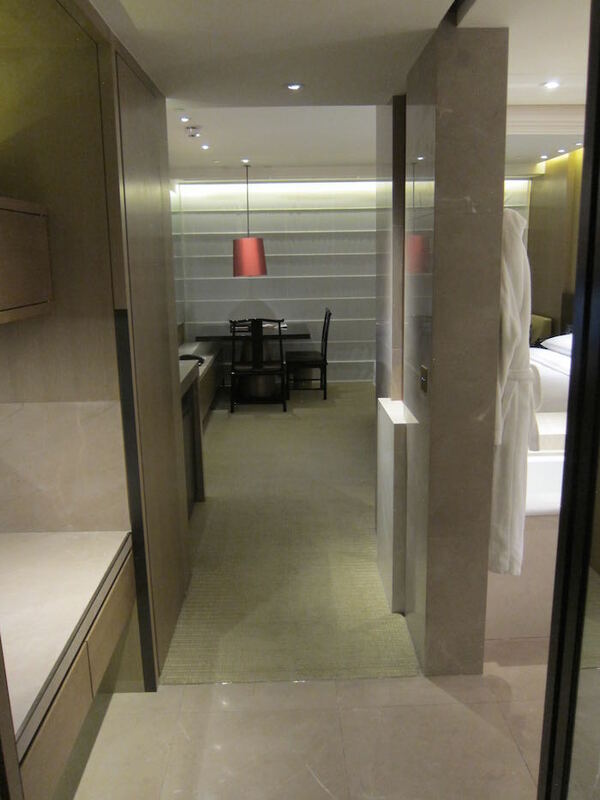 The room itself was a great size for a “standard” hotel room in Hong Kong. And while the public facilities feel very in line with what you’d expect from the Grand Hyatt brand, the rooms feel very Park Hyatt-like. Once I entered the room, the bathroom was located to the right and luggage storage and a closet were located to the left. The room featured a king size bed which faced a flat screen TV. The bed was on the firm side, though still comfortable, in my opinion. The room was separated from the bathroom by a glass shield, though fortunately there were privacy curtains that could be lowered. That’s the best of both worlds, as far as I’m concerned. It makes the room feel bigger, though at the same time nothing is worse than a room with a glass shield and no privacy curtains. In the back right corner of the room by the window was a chair with ottoman. Then in the back left corner of the room was a dining table with two chairs. The dining table seemed to be there in place of a desk, which I sort of didn’t mind. It’s not often you otherwise see a legitimate dining table in a standard room. The room boasted amazing views of Hong Kong Island and Kowloon. The Hong Kong skyline never gets old for me. While I ultimately prefer the views of Hong Kong Island from Kowloon over the views of Kowloon from Hong Kong Island, this was still pretty awesome. Then to the left of the TV was a Nespresso machine and the minibar. The bathroom was well appointed as well, with a sink in the center. Then to the left was a bathtub, close to the bed. And to the right was a walk-in shower with both a ceiling-mounted showerhead as well as a handheld one. 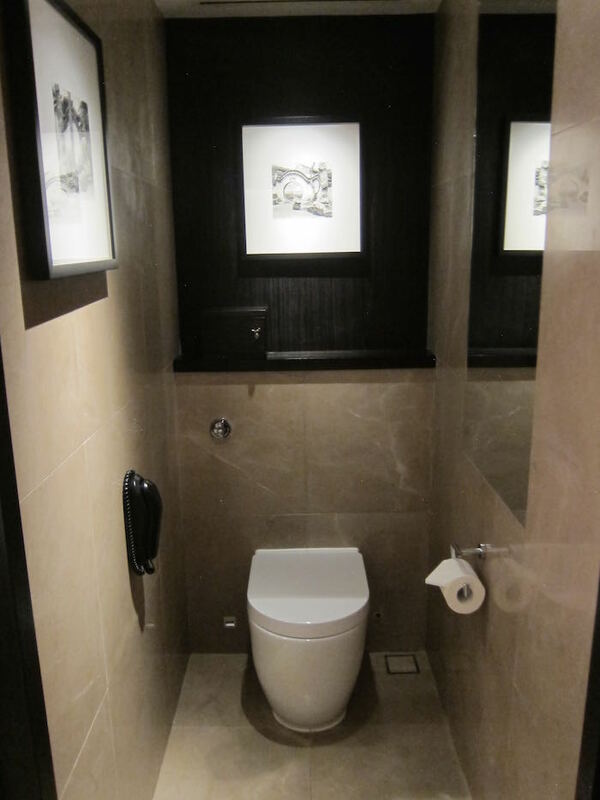 Then there was a toilet with a separate door (maybe it’s just me, but I do really appreciate that). And then I saw the toiletries. They were June Jacobs branded. Now I realize that’s pretty “brand standard” for some Grand Hyatts, which is largely the case because Grand Hyatt lacks an identity, and has properties ranging from $80 per night airport hotels to $400+ per night city hotels. But offering June Jacobs toiletries in a hotel of this caliber/price point is roughly the equivalent of serving Duc de Paris champagne in first class… and surely no airline would ever do that! You’d think they could at least offer a decent line of toiletries. 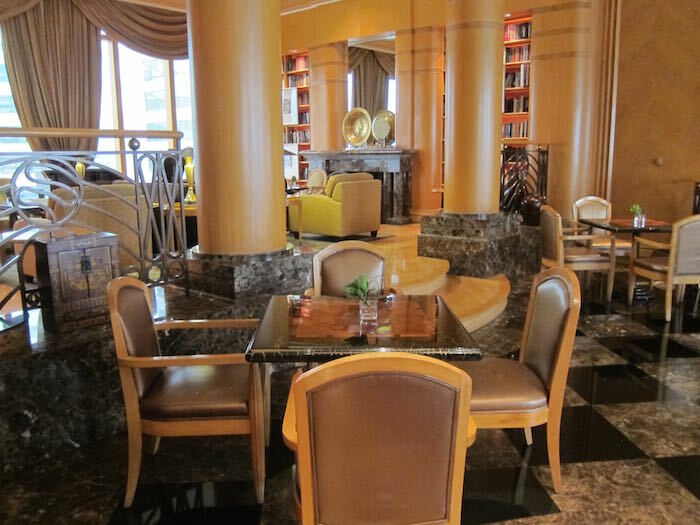 As far as the club lounge goes, it’s located on the 30th and 31st floor. The main lounge reception is located on the 30th floor, and then you can take the rather grand-looking staircase up to the 31st floor, where most of the seating is located. 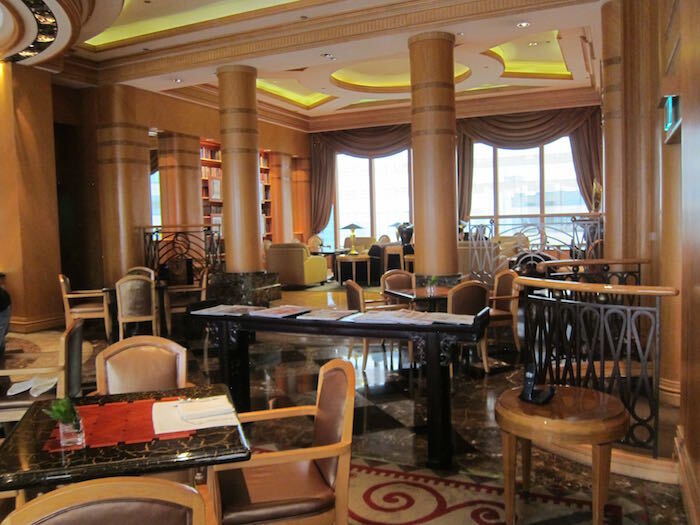 The lounge is gorgeous and has panoramic views of the harbor and Hong Kong Island. After checking in and catching up on a few emails I figured I’d take a quick look at the lounge, so walked up there at around 11PM. I was sad I had missed the evening spread, since I have heard this is one of the best Hyatt club lounges out there. The first thing I noticed is that while they didn’t have food anywhere, they did have champagne available, so I grabbed a glass. And then I noticed a few friends seated in the lounge, by chance. So we sat down and talked for a bit (and drank a couple of bottles of champagne, of course). He actually turned out to be quite amusing, though I’m still confused about what happened there. Or why he was in Hong Kong. Or how he’d make his ex-wife jealous by being with a bunch of aviation geeks on Valentine’s Day. I started to think about it less a few glasses of champagne in. And then he started smoking in the lounge, even though it’s non-smoking. And then I left. In the morning I quickly checked out the breakfast buffet, which was impressive for a club lounge. I’ll let the pictures speak for themselves. In addition to the buffet there was a small menu of Chinese options. *From 23 February 2015, Grand Club lounge will be closed for renovation for approximately 10 months. During the period, the lounge will be relocated to 5th floor. The business lounge will be managed by the Grand Club team with the same offerings where complimentary breakfast, evening cocktails will be served. The one-hour complimentary use of a meeting room, subject to availability, will be moved to the Business Centre meeting room. After breakfast and showering I was off, sad that I didn’t get to enjoy more of the hotel. The last highlight of my stay was at check-out. The guy checking out next to me just threw the biggest temper tantrum because apparently he phoned down to have his bag picked up, and no one showed up within five minutes. He then threw his sunglasses on the counter to express his disappointed (fortunately his Louis Vuittons stayed on), and insisted he wouldn’t be paying for his stay. 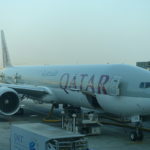 His hands then flailed up as he said “I had to carry my bag down on my own.” He pointed at his bag… which was a carry-on. Ultimately this was just a really quick stay, though based on what I saw I was impressed by the Grand Hyatt. The public facilities really capture what you’d expect from a “Grand” Hyatt, while the rooms are near Park Hyatt quality, minus the toiletries. The club lounge breakfast spread was great, and based on what I’ve heard the evening spread is even more impressive, so I’m sad I missed it. 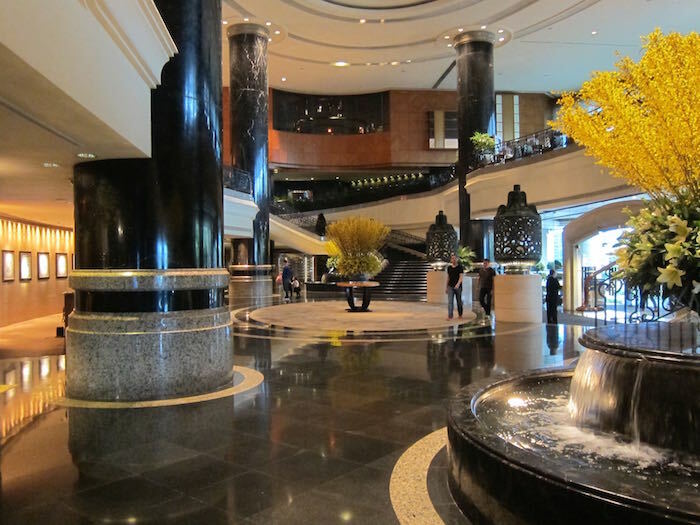 There’s no denying this property is a step above the Hyatt Regency Hong Kong Tsim Sha Tsui. The rooms are marginally nicer while the club lounge is significantly better in terms of the offerings. The one advantage of the Hyatt Regency Hong Kong Tsim Sha Tsui is that you get a complimentary smartphone for the duration of your stay, so you don’t need data locally. The other major consideration is that this property is on Hong Kong Island while the other property is in Kowloon. So I’ll copy what I wrote about Hong Kong Island vs. Kowloon in my last trip report below. But all things considered the Grand Hyatt Hong Kong is at the top of my list of properties to return to in Hong Kong. Should you stay on Hong Kong Island or in Kowloon? One question I’m often asked is whether I prefer staying on Hong Kong Island or in Kowloon. For those of you not familiar with Hong Kong geography, Hong Kong Island and Kowloon are separated by Victoria Harbour, so it’s a quick 10 minute ferry or subway ride to get between the two. The Hyatt Regency is in Kowloon, while the Grand Hyatt is on Hong Kong Island. Which location do I prefer? To be honest, I don’t really have a strong opinion one way or another. There are pros and cons to each. So there really are pros and cons to both, and since it’s just 10 minutes to get between the two, I don’t really have a preference as to which “side” I stay on. Should You Buy Best Western Rewards Points Through Daily Getaways? What’s The First Flexible Points Card You Should Get? I stayed at the GHHK last April, while itt was being renovated. I did not like the hotel, my room did not have the Park Hyatt feeling you referred to. Plus it is a bit of a trek to go to Wanchai MTR or even to find a Seven 11 (you have to go through several foot bridges). Meanwhile I really enjoyed the Hyatt Regency in TST, fairly new room and nice amenities, right in the main shopping district. At least you didn’t run into him again on your flight out! Nice report. 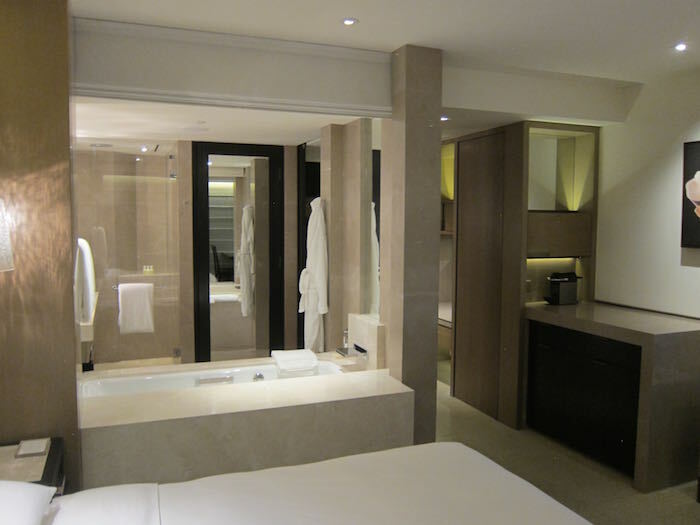 It is usually on small details such as the cheap toiletries that Hyatt and Starwood miss the opportunity to really shine when compared to other luxury Asian chains. Do you see Hyatt opening or converting one of its current properties into a Park Hyatt property in Hong Kong? Great report Ben and I can express the same feelings as you about Hong Kong. It is indeed one of my favorite destinations and can’t wait to return. I have no preference in which part of hong kong as far as hotels. I also enjoy the Kowloon side for the local feel. On my last visit I stayed in Hong Kong island and it was lovely. This hyatt seems to be a great property – thanks for sharing. @Lucky — I’m a huge fan of HK as well, so I just wanted to add a “pro” to your list of HK Island pros: nightlife. When I’m in HK I’m there for work and traveling alone, so I don’t partake, but if nightlife is important to you then you would be better off on the Island as this is where most decent (translation: not sleazy) bars and clubs are. You can obviously find sleaze and niceness on both sides, but HK Island has the higher concentration of cool nightlife. That said, I, too, don’t think there’s a clear winner. I always stay on the Island, because it’s where I have to be for work and commuting would be insane, but if I were there for purely leisure then it’s a toss-up. Ah… our family stayed there last month and this all brings back the memory. Our grand club room was one of rooms that haven’t been remodeled yet so it looked little old but still the grand club lounge was most impressive. Hey Lucky, what champagne r they serving, n if the champagne is also avail for breakfast? Aside.. can u recall which club lounges serves alcohol all day u have been to.. n also the club lounges that actually hv champagne? I would think both lists will be v short. Maybe the higher category rooms have different toiletries? thanks for the review. HK has some great hotel choices. last few times i’ve been i’ve developed an affinity for Langham Place. i like the location in mong kok as it’s right above the MTR station and mall but the surrounding neighborhood is still very local and non-touristy. 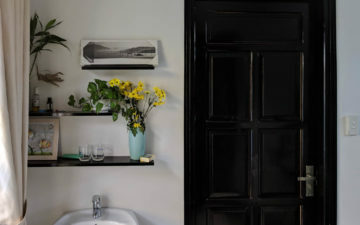 as for the hotel itself, i’ve been really happy with the modernity and quality of the rooms but i haven’t explored much else of the property. would def recommend first time visitors to HK stay on HK island proper. kowloon is nice for the view and some eating/drinking in TST but going back and forth to central can get tiring. @ flyingfish — I didn’t see champagne in the morning. I believe they offer Ruinart in the evenings. @ A. S. — Excellent point! @ Santastico — I don’t think any of the existing properties fit the Park Hyatt profile. They’re too big and not “boutique” enough. It would have to be a new property altogether. 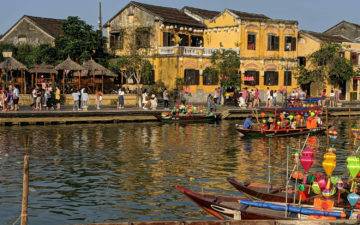 Lucky, you are being too nice when review Asian hotels and airlines. You need to use Asian standard to judge. For example, if flight attendant didn’t kneel down when serve you, then that’s one point lose. If you ask something, hotel didn’t send to your room within 5 minutes, that’s a point lose. After handing you immigration form, if flight attendant didn’t ask you if you need a pen, that’s a point lose. (Unless there are pens in amentity kit. In fact, hotel even need to pay attention to customer’s culture background. Welcoming gift can never be a clock or things that looks like clock. Welcoming fruits shouldn’t have pears but need to have oranges. That’s what make the luxury hotels market so competitive. can you take the airport train to a stop near this hotel or free shuttle? While the renovated rooms do sort of feel like a Park Hyatt, the regular rooms seem to be simply too small to feel like a Park to us. @ Danray — The Airport Express goes to Hong Kong Island and then there’s a shuttle that runs to the hotel. i returned to the grand hyatt after 5 years just this month for art basel hong kong and was also shocked by the nasty june jacobs toiletries. fwiw they used to supply very generously sized 200ml bottles of aesop back in 2010, at least in the club rooms. in other news, the florist in the lobby has to be one of the prettiest (or most gorgeous, in lucky parlance) hotel florists ever. Lucky, did you happen to notice what they were serving. When I was there in Feb, I was first served a few glasses of Chandon (not Moet, California). Then about halfway through service, I noticed the tell tale bottle of Ruinart coming my way. I thought the waitstaff made a mistake. But alas, more and more bottle came out. It was amazing and unbelievable that they would pour $60 stuff rather than $15 stuff. What?!? @ Heather — My understanding is that they offer Ruinart during the event reception, and then later at night they have Chandon. @ Lucky-That’s awesome! When I first arrived near the start of cocktails, Chandon’t it was, but when more folks arrived it was Ruinart. I suppose that night they were saving the good stuff for more people. I probably would have polished it all off before 6 hehe. Now that we think about it, room design looks like a downmarket version of the Park Hyatt Sydney. 1. Can you take breakfast down at the restaurant at the GH hong kong? 2. Is there local restaurants and shops around the hotel? Stayed at the le meridien last time and it was boring around there. @ danny — Not as part of the Diamond benefit, as far as I know. And yes, lots of restaurants nearby. This hotel is much more centrally located than Le Meridien. @lucky & danny: In March, I was able to take my breakfast in the restaurant. It was amazing! One fun fact: I was charged (an insane amount) for ordering soda water (seltzer). They make fresh to order pressed juices there and those are free, but carbonated water is paid. Cash and points vs all points? Why would you value C&P as a better options? How I see it C&P of 12,500 + $150, is equal to $275 in chase UR points if we are doing transfer, which I think most does. Where all points of 25,000 would equal to $250 in chase UR points. So if not using a DSU, would a all point stay be worth more?? ?